US markets managed to grind out another positive session last night and Asian markets were positive over night. The FTSE, CAC and DAX were set for a flat open until two major European companies gave the bulls the shot in the arm they needed. BP’s profits halved, but thanks to cost cutting measures, the numbers were well ahead of estimates. In Germany, Deusche Bank’s profits increased 68%, again ahead of estimates. With both companies making up a big percentage of the FTSE and DAX respectively, Tuesday has already got off to a good start. Today we have UK CBI realised sales at 10.00 GMT then a gap until the latest US house prices are released at 13.00. US consumer confidence follows at 14.00 then we have a number of Federal reserve speeches throughout the day which could impact on the dollar. Commodity currencies are flying high this morning with the Norwegian Krone up 0.80% against the US dollar, the Canadian dollar up 0.50% and the Aussie dollar up over 1%. The Aussie dollar is also performing strongly against the Japanese yen, quickly approaching the psychologically important 80.00 level. 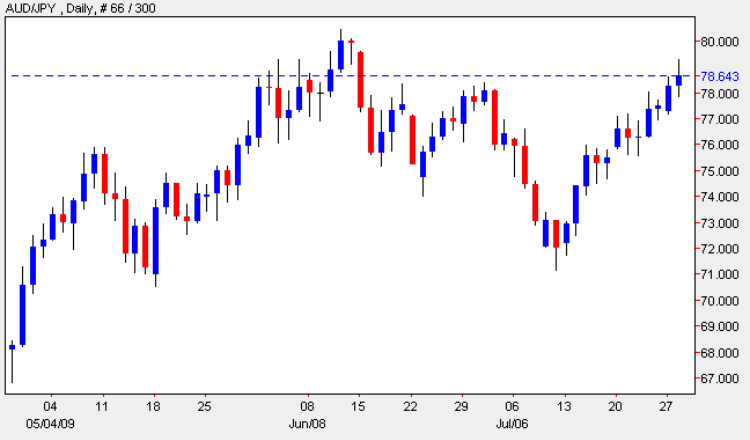 This makes the AUD/JPY today’s pair in play. Momentum is behind the pair which might make intraday trades such as double or flash bets a good method up to 80.00. Double trades always return 100%.